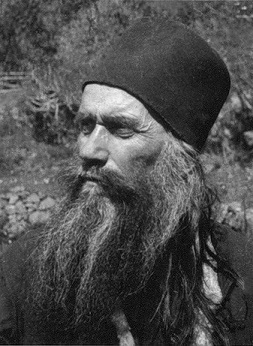 The venerable Silouan the Athonite (also known as Silouan of Mount Athos) was born Simeon Ivanovich Antonov. At the age of twenty-seven he left his native Russia and came to the monastic state of Mt. Athos (an autonomous peninsula in Greece) where he became a monk at the Monastery of St. Panteleimon. He was glorified by the Ecumenical Patriarchate in 1987. The Church venerates saint Silouan the Athonite on September 24. An ardent ascetic, St. Silouan received the grace of unceasing prayer and saw Christ in a vision. After long years of spiritual trial, he acquired great humility and inner stillness. He prayed and wept for the whole world as for himself, and he put the highest value on love for enemies. Though barely literate, he was sought out by pilgrims for his wise counsel. His writings were edited by his disciple and pupil, Archimandrite Sophrony. Father Sophrony has written the life of the saint along with a record of St. Silouan's teachings in the book «Saint Silouan the Athonite». "Keep your mind in hell, and do not despair"
The fourth, absolute, love for God is to have grace in your body as well as your soul. Such a body will become holy and leave relics. This happens with great martyrs, prophets and saints. Whoever has reached this level is untouched by bodily love.